Hey, Bourdain, I would have loved that roll. That moment you laugh when your professor, your mentor, your brother calls you out on shirking your deeper responsibility toward your own journey. I mentioned sparring (rolling) with Chef Anthony Bourdain about 2 years ago on my other blog, TheGaitGuys.com. It never happened, and now, it never will. At the time, Bourdain and I were both blue belts in Brazilian Jiu Jitsu. Bourdain did not know me, nor I him, but we had some things in our lives rooted in common ground. His death to me was a bold punch to the gut, one that doubles you over and makes you stumble backward begging for breath. I think his early life departure in 2018 hit some of us hard because we felt some inner connection, perhaps jealous aspiration, to him and the life he appeared to have commandingly by the tail. Bourdain and I had some commonalities, the love of good food, a late life start into Brazilian Jiu Jitsu, writing, art, and creative outlets. His broad palate of creative works was an inspiration to me. I also enjoyed what he said, but more so how he said it; his descriptive and colorful command of the English language spoke to me. Bourdain's death was a tragedy to us all, the world has lost another creative talented soul. In a unique way, similar to living into one’s 40’s and 50’s, I think the purple belt represents the mere beginning of one’s enlightenment years. A time when things just start to make a little more sense in life. I recently was presented with my purple belt in Brazilian JiuJitsu from one of the art's legends, my mentor, my brother, 4x World Champion, Professor Carlos Lemos, Jr. Some consider the purple belt as a transition in the art where the basics start to congeal into something more clear and meaningful. (I refer the reader here to my previous post on "the language" of jiu jitsu LINK). It defines the completion of a long base of fundamental work, and of stronger resistance, heavier responsibilities and bolder headwinds to come. It took me 5 years to get my purple belt in jiu jitsu. This is far longer than it will take many to get to this stage, many will be into their brown belt by this point, yet still far from the coveted black. 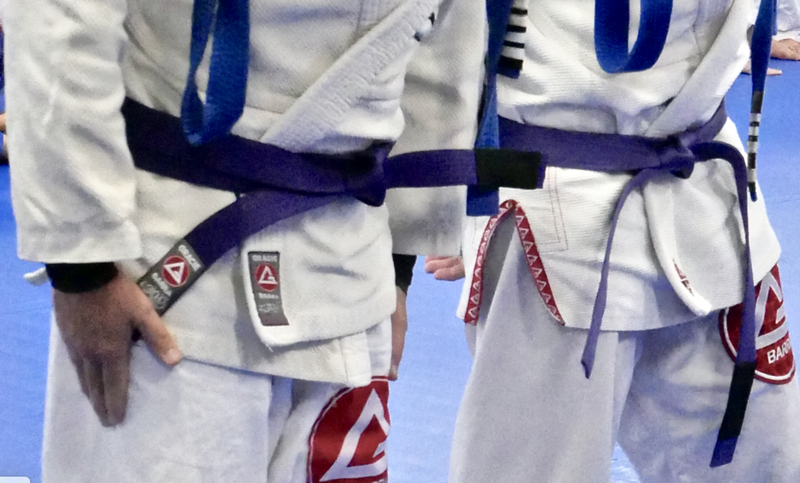 In Brazilian jiu jitsu, purple does not even mark the half way point to the multi-tiered black belt. Thus, my mere five years still represents a kind of adolescence in the journey. Many will not get to this purple stage, they will quit before they reach this pivotal point in this most difficult art. Trust me, I almost gave up as well, I too found all kinds of excuses to abort, but for me the trick was to make myself go to the academy on the days I truly did not want to, when I was finding something else that I could, should or wanted to otherwise do. When we are uncommitted, it is easy to find excuses not to follow through. We might use our marriage, our work, our kids, money, time, injury, these are all excuses that will be victorious if one lets them grow into such a thing. If one is weak enough, an individual can let one of many forms of resistance grow into a plausible victorious excuse, one that trumps commitment and personal growth. I know this problem all to well, it is part of my past and my every day. Wishing and hoping are like dreams, they are not real, it is only execution that makes anything real. How badly do we want it, that is the greater question. The color purple, the color of resistance? I am slow at learning what many already know, that the stuff in life that seems to matter is the stuff that is difficult. It is the stuff that we have to work hard at. It is not the stuff that comes easy, it is not the gifts and not the handouts. It is often the stuff that makes us weak and tremble. It is the stuff that actually asks something more of us, it is sort of a sacrifice to step into an unknown void. I recently had a patient come in who is a recovering heroin addict. As I was working on his shoulder and he rambled into a dialogue about feeling lost in life. I have known this young man since he was a little boy.. He said he was looking for some relief and an easier time in life. I asked him why he was looking for that and he said he was tired. I asked him to at least consider if perhaps he needed something else that was difficult and hard to embrace, something else that would ask him to make a different kind of sacrifice in life, a different set of choices. He looked blankly at me. I expanded my words, sharing with him what a jiu jitsu lifestyle looked like; mental and physical struggles, fitness, rewards, commitment, loyalty, purpose, brotherhood, family, leadership, general well-being. He said it sounded like just what he needed. It is never hard to give out the phone number for that recipe. I'm not sure I fully deserved this purple strip of heavy cotton around my waist. I am not where I should be in my opinion, but I am where I am. In any chapter of life, it is about accepting where we are. To my mentors perspective and wisdom, I think maybe, just maybe, this was a message to step forward, to step up, and accept the responsibility of where I should be and force me into the responsibilities I have been shirking. And if that's the case, the point was made, loud and clear; step into the resistance, accept active responsibility. Take action, instead of making excuses. These are easily comments made on many of our lives. Easy doesn't pay the bills. Easy doesn't generate growth, or insight. Easy doesn't add to a quality of life and a sense of achievement. The dis-ease of "easy" has led most into regret upon their last hours of a life. Bourdain was right on some things, many things in fact, this could be noted if you followed his work over the last decade. He is right in that I will never be a younger man than I am today, but with constant pressure against resistance at the age of 51 I do feel better than I did a decade ago. This year I will work to be faster, stronger, and more flexible than I was last year. The alternative path will not get me to a better place, so I will meet those resistances head on. As Bourdain eluded to, I too may not win a battle with a 22 year old, but knowing what I know now, it just might now be fun to try. As for Bourdain's feelings on a black belt, I do not care much either. I have more deeply discovered that meeting the path of resistance head on in the moment, and facing the responsibilities and expectations that confront me as I press through the dominance hierarchy (thanks Jordan Peterson) is the true journey. I was getting lazy and complacent as a blue belt in arguably the toughest martial art that exists. Having purple firmly tied around my abdomen, and all of the responsibilities that accompany it, was a lesson I needed to feel deep in my being. I believe that if one is not struggling and moving forward into more difficult winds, they are being held back, in fact losing ground, being further pushed back by one's own laziness in accepting that place of mere perceived comfort. Nothing good comes from complacency, even though we feel stable and safe, that is the deception of the moment, we are in fact becoming more fragile. Lesson learned. I was the clay pot, never to meet the heat of the furnace.
" A clay pot sitting in the sun will always be a clay pot . . .
Purple. It might just be the true color of resistance in this art form (I reserve the right to amend this statement). If you choose to give up on jiu jitsu, make it a real good reason, because it just might turn into later regrets. I quit for 2 months early on, and I am ashamed of that. If you say it is because of your work, your marriage, your school, your whatever, have a good talk with yourself. Make time for something this important. This is not supposed to be fun or easy all the time, if it is not hard at times, you are doing it wrong and you are not being forced to grow. If you disappear after a year, you missed the message. This is a journey, a marathon, a lifestyle, a grand path inward, and outward. If the journey showed you the destination too soon, the pot of gold, the long path to enlightenment would be missed. If you are not getting what you want, don't leave or give up. Those things might not be what you need. Be patient with the lessons of jiu jitsu, often you will be surprised that what you needed was far different than what you thought. This goes for our training, and our lives. Let the art deliver its message and lessons to you. Most things in life do not turn out how we hope or plan, but often the best things in life are the surprises. If your focus is the color of your belt or the number of stripes on it, you are missing the point. This is an investment, a lifetime journey and insurance policy on our soul. Forget about the color of the cloth around your waist, or around another's waist for that matter. Persistence always wins. Even if you lose, you win. I've been here 5 years now. I'm still here. I have seen more people leave, disappear, or give up, than have persisted. Pace yourself and stay the course, sprinters do not get very far. Be the tortoise, not the hare. Look beside you. One of the people on either side of you won't be here in 6-12 months. The problem is, we forget that the person beside us is saying the exact same thing about us. Don't give them the satisfaction of not being present on the mats in a year, persist, prevail. Stay the course. Stop trying to win each time you spar. There's very little value and feedback in winning. The lessons are in the losses, the meaning is found between the arm bars and chokes. The lessons are in the smallest of things, and often in the sharing afterwards. Stop trying to win. Be a step ahead of the guy trying to win, be the observer, be this listener, you will learn more. It is all relative, see your journey as where YOU are at this moment, not where others are. The beauty of this art and it's journey is that you cannot and should not compare yourself to others. Let others help to be a measuring stick for your own progress, but more importantly, mostly compare yourself to your yesterday's self. What do I mean by this? Let me help. I am a mere footstep into a Purple belt. I cannot compare myself to other purple belts that have been here a year, let alone one that is 20 years my junior. Nor should I compare myself to a youthful 25 year old blue belt who is just 3 years out of a college wrestling program. I cannot compare myself to a 200 pound white belt. I cannot compare myself to a 60 year old black belt. I am my own unique package, a 51 year old, 155 pound doctor who trains a few times a week, who's hands are raw and pummeled by most Tuesdays. I cannot compare myself to anyone else other than the person I was yesterday, nor should you. Trust me on this, I speak from experience. Most things in life that are worth anything do not come quickly or easily. This is about choices, habits, routine, commitment, struggle, fear, pain, and sacrifice. This is about meeting resistance every day. Close your mouth. Open your ears. Show up. Practice. Be patient. Share the story of your journey, it might save someone's life. Dear Chef Bourdain, I would have loved that roll, but maybe in another dimension it now seems. However, I am going to imagine that a few threads within the tapestry of this purple belt are yours brother, just as there are threads within it of my fellow academy brothers and sisters. Through them I have reached this stage of the journey. Bourdain, rest peacefully until we meet old man. Save a little sweat for me, and a heavenly street side "meat in tube form" with all the fixin's, for I am a fan as well. Sometimes we need a "band of brothers" to shine a light of truth on our ways, leading us back to the honest path. Thank you Professor Carlos Lemos, my fellow teachers, and all those who paved my path to this point. The struggles, pain, sweat and defeats were worth it, and continue to be. Being completely honest with myself, I can see the woes of my ways in finding peace in comfort and complacency. I feel that I did not honorably serve the blue belt previously wrapped around my waist to the level I should/could have. That weighs heavily on me, this early part of the journey feels a little tainted now. And because of that, this purple wrap now too weighs heavily upon my hips, and with it, a bigger target on my back. Lesson again learned. It is time to make things right.